Hi and welcome to the second mod-lesson for a Family of Grave Diggers! Well, the first post was just an overview so we could consider this one to be the first real mod post, but enough talking, lets dive in and get to work! Now, now, not too fast, lets start with something easy just to check things out. 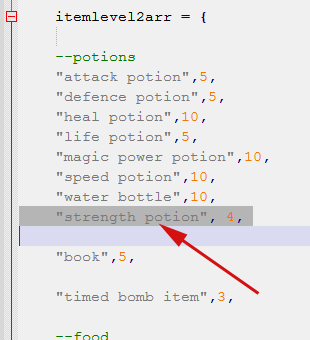 A potion that adds 1 point of attack permanently, the Strength Potion (Graphics Credits Ail)! Open your game folder, the copied one (see post 1 for instructions where you have copied it), open Mod/gfx/item and copy the icon in the two folders /mapsize and /slotsize. Open the file with your favourite text editor (or another if you feel rebellious). The items in a Family of Grave Diggers are all made up like this, a graphic part and a “code” (or script) part. Come back, it’s really easy to script things! The file needs 6 functions, this is what make the item tick and moreover it tells the game what to do with it (I put what we’ll use in parentheses). For the type, there are a bunch of types: USE, EAT, SHOES, HEAD and so on, we’ll use the “USE” type as the player will actually use the item. The only other specificity is the sixth bulletpoint, the USE function! Let’s insert it in the random drops! Go up two steps to /Mod/Script and open droprandomitem.lua. It’s a fairly powerful item so lets make it a level 2 item! Search for “itemlevel2arr” and add it to the list of drops, with a half-low droprate (droprates are just important comparing to other items in the same level, they are not percentages). Note: the name is the filename without the .lua extension. Done! Now just play for hours and hope the monster you just killed will drop it! Or maybe we’ll cheat a little bit to check if we didn’t make some typo when we wrote all those script lines right? So hold your hat because we are going to cheat! data.xml for running monsters, items, bonuses et al. and finally glob.txt which is the most hideous one but it’ll do our deed. I mean it! If you mess it up, you’ll loose all your progress and the game will just go bananas. 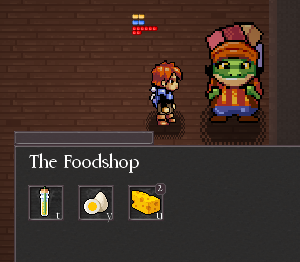 On the line following SHOPITEMS_FOOD, you’ll find a list of all the things the first shopkeeper (the green guy with the cheesy cubes on his head) sells. The line (warning, never erase or insert a newline in this file!) is composed of a name, a comma, a number (the variation) and a semicolon. Now lets add our potion to the line! Save the file, take a deep breath and start the game. And voilà, the shopkeeper now gives away free potions! Have fun with an abnormous attack and see you in the next episode!